The January meeting didn't happen. The last that we were together was at the Christmas party in December. Bob Torbet led a very limited meeting with a few of his stories and some great prizes. There were many families represented around a big U-shaped table at the Lima Elks. We all had a great time visiting with one another. Looking back at the 21st Jamboree that our club hosted - John and Marty Riley now have the DVD of the event ready for purchase. The club did nothing for John during the tour weekend other than give him the opportunity for he and his students to record the events on film (or whatever they call recording media today). He has undertaken this task to help his students to understand how to make a documentery. There is a hope to sell a modified version of this 1 hr 15 min film into a PBS special. If you would like a copy of the film that he put together of our use, you can contact him at Albemarle Productions, 492 Leeka Road, New Vienna, Ohio 45159. The DVD is $20 plus $4.95 for shipping and handling. Call John at 937-414-0956 if you have any questions. I want to thank all of my Model T friends for the prayers, thoughts, and support that was given to me during my recent bout with cancer. It was greatly appreciated. I really thought that I could work on the web site during my recovery. Some things just don't happen, no matter how well meaning are the intentions. This picture was posted to the MTFCA site to get an idea of who may have produced this old car jack. There were the usual guessing kind of answers that we all attempt to come up with off the top of our heads. But one guy goes way beyond the line of duty to come up with the patent number and a print of the concept. The guess is that it is an axle/or a fender jack for an early 30's car. The fact is that it is a Walker jack designed to fit a fender in 1933. Estimated value is $10. Those that have tried this jack, say that it falls over easily. 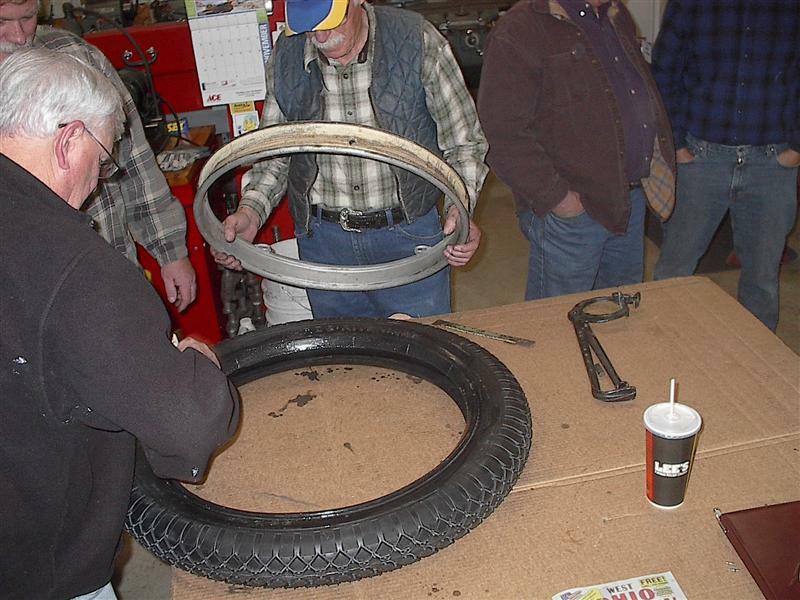 As a learning exercise, clincher tires were removed and new tires mounted by President Torbet. To say the least, it was a learning experience and many hands were dirtied in the process. In the end Bob got two tires mounted. With new tires fully inflated, he now has a negative clearance with the garage door opening. Better luck next time, BOB. 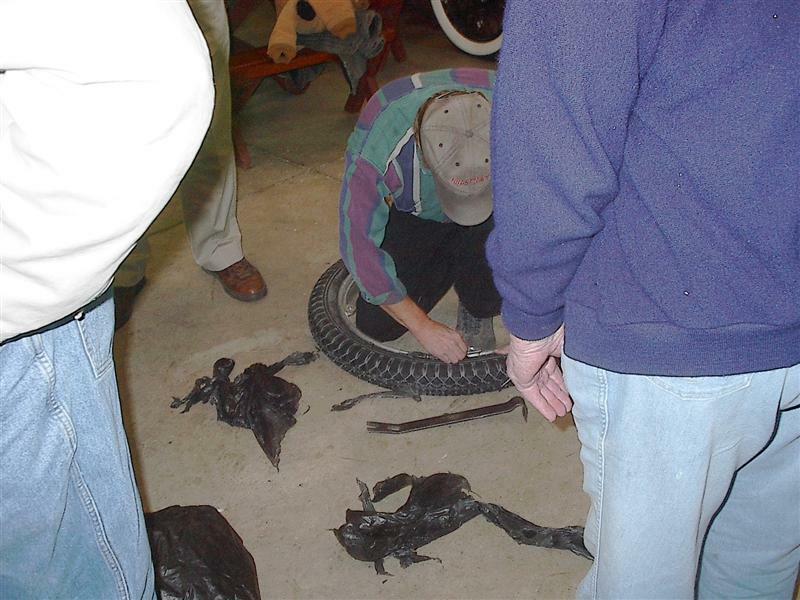 Bob used the plastic bag method of mounting the tires. This proved to be a little more trouble than it was worth. If a little bit of the plastic stays in the tire rim, it will be OK as long as the tire pressure is maintained. There was an opportunity to also use some of the interesting tools found in Jacks shop. 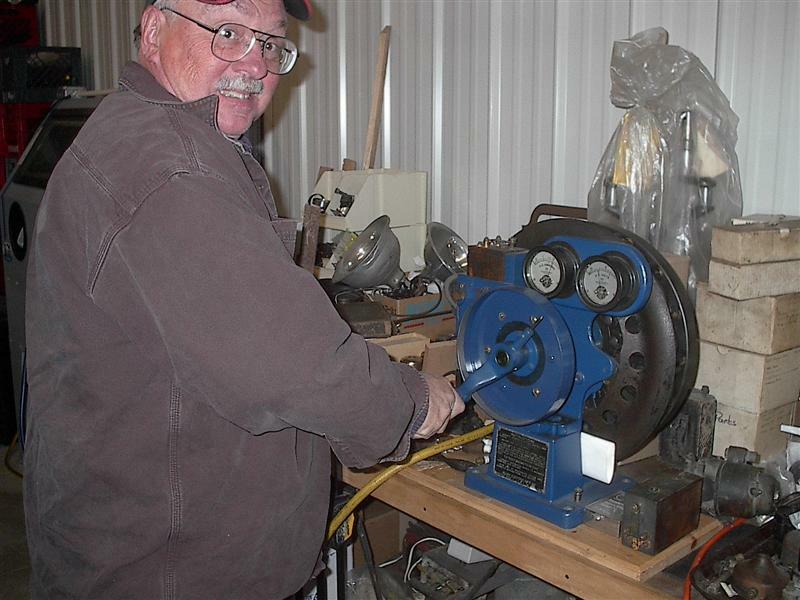 The coil test is always there for the needed energy source to get those little sparks jumping.